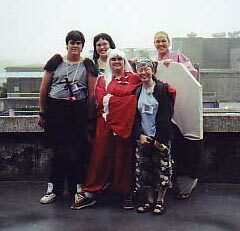 Animefringe: August 2005 - Specials - Cosplay 101: So you want to be a Cosplayer? Remember the last time you went to a con, and you saw tons of people in awesome costumes? Would you like to join the crowd? Here are some useful (and some not-so-useful) tips on cosplaying! Just how important is cosplay? Well, after having been to three whole conventions, it became clear to me that without cosplay, there would be no convention. But just how easy is it to create a costume that fits well and looks good on you? 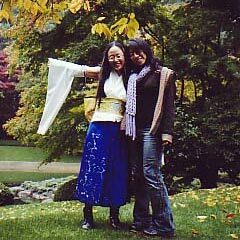 The Cosplay Panel at Sakura Con 2005 assured me that making a costume is no easy task, but this challenge motivated my friend Jenny to set off making her own Okuni (from Samurai Deeper Kyo) kimono top during the following month. For someone who has never had any sewing experience, I never thought that making a perfect fit by hand would be so much trouble until then. She asked me to help -- and I learned a lot. Then I thought, someone should write a list of advice on cosplay in general, for aspiring cosplayers... so here are my tips for potential cosplayers! This is by far the best and the easiest way to get the perfect costume. By using this method, your costume is guaranteed to fit you from head to toe. However, not everyone can afford to pay $300 for a simple school girl uniform. On the other hand, cost seems to be the only problem. A professional tailor (or a wedding dress seamstress) specializes in making clothing that fits perfectly. Be generous in providing as many reference pictures of the character at different angles as you can afford to. If you have a gashapon figure of that favorite character of yours that you are willing to part for a week or two, lend it to whoever's making your costume! 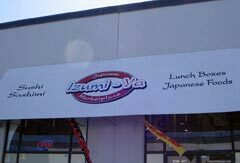 (If you can trust them with your $250 deposit, you might as well trust them with your gashapon!) Remember, they can never have too much information. Knowing a character's height is especially useful if you are into group cosplay. If you are petite, but you want to cosplay Sailor Jupiter, then unless you can convince a few of your friends (who are shorter than you) to cosplay Sailor Moon or Sailor Mercury, then don't. Likewise, if you are into Escaflowne, can we have a short Allen and a tall Mole Man? Absolutely not! Unless they are in different cosplay groups, the two of them will look awkward and out of place. If you are cosplaying a character by yourself, then it is best if your build is like the character's. 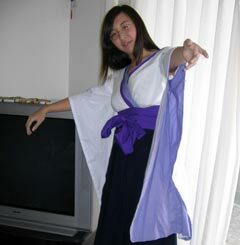 Let's face it: the word "Shippo" does not immediately come into recognition if he is cosplayed by a tall, slender girl. (You can totally skip the rest of this article if you're loaded with cash.) Definitely know how much money you have or how much you are willing to invest in the outfit before doing anything drastic. It is advisable to make a budget list beforehand, and to deduct the cost from there. If you are making your own costume, then do an approximation on how much you are willing to spend on each part of your costume beforehand. Be realistic on material prices. Visit or phone a fabric store, such as Fabric Land, a couple of times in advance. Bits and pieces always add up. For example, the fabric required to make a kimono top can easily add up to over seventy-five dollars, even when you don't make mistakes in cutting, which you can count on. 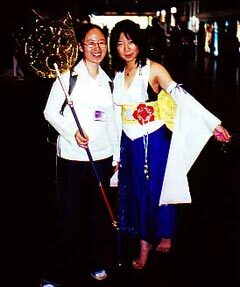 If time allows, decide on which character you would like to cosplay as soon as possible. Then, try to collect bits and pieces of the costume throughout the year. If you give yourself time, then you really save a bundle (especially when you get them when they are on sale). Just be sure to keep a checklist on what you already have and what you still need. You don't want to end up having five variations of the same headgear. 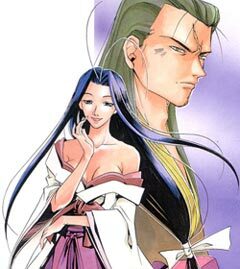 Then again, if you can't find exactly what you want, you might want to consider buying a simple kimono and modify it in order to resemble the specific character that you want to cosplay. 6. Should We Buy Online? Unless this is a large and well-known online shop with a plethora of positive customer feed backs, your guess is as good as mine. A word of caution: some online sellers may tell you that all of their costumes are custom-made, but they are not. They will ask for your size, and then go into the warehouse and grab the one that is the closest to your size. When you buy online, use plenty of discretion, and be ready to make some adjustments afterwards, especially if the cost of the 'custom-made' piece is ridiculously low. My piece of advice on going international: don't. Buy domestic. Otherwise, you have to face higher shipping charges, a greater chance of merchandise becoming lost or damaged during shipping, and let's not forget about custom charges. 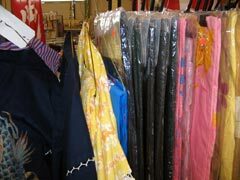 If you don't mind wearing previously-owned clothes, then the best time to get a good deal on costumes would be through eBay after the spring/summer convention season is over. For one reason or another, most people do not wear the same costume twice, and they usually cannot find enough space to keep their costume in pristine condition at home. As a result, these goodies usually end up on eBay afterwards, especially near the fall. Previously-owned clothes are normally not old clothes; they are usually costumes that have been specifically made for one person and worn only for a specific convention or two. Thus there shouldn't be any major sanitary problems, unless you have very sensitive skin. A great thing about shopping on eBay is that the bidding price may start from as low as $0.01 with no reserve ('no reserve' means that the seller is actually willing to part with the item at its starting price, so if you are the only person who bids on that new PSP, you actually only need to pay 1 cent for the item), but of course the price will increase dramatically! Just be careful to avoid bidding vigorously (swallow that ego, bro!) and spending more than what your budget allows. Again, some eBay sellers claim that they also custom-make the costumes for you. I strongly urge you to read a page or two of their eBay feedbacks. If the seller has more than a hundred 100% positive feed backs, then he or she is not bragging about his or her ability to make that perfect fit. (I recently bought an outfit on eBay, and it was close to perfect.) Nevertheless, it is important to remember that these seamstresses cannot see you, so if you can send them a picture of you that shows your body shape, that'd be helpful as well. Don't forget to ask for their permission first. You don't want to flood their email account. Okay, that's it! That's about all the advice that I can offer. Just be careful of what you step on when you are making your costume or having it made; expect to spend a jolly-long time ironing silk fabrics if you accidentally step on them! As well, this should be obvious: don't leave pins everywhere, especially on dark-colored floors! One more thing: always handle your costume as something extremely delicate. Handle them like those that cannot touch water (use lint rollers! ), or those that can only be dry cleaned. Happy cosplaying!